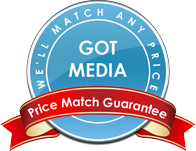 GotMedia.com also specializes in disc duplication and replication services in Orange County, CA. 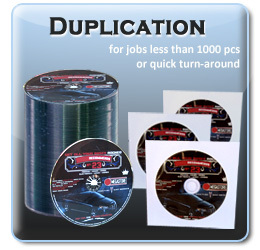 So if you have further needs in addition to owning your own duplicator or printer for your home or small business, consider calling us to inquire about or various CD DVD duplication services as well. We have decades of experience in our industry with duplicating CD-Rs & DVD-R Media for both small businesses and large clients, and we can get it done for you on time and on budget. Call us today to learn more! "Any quantity from 100pcs to 10,000pcs"
Gotmedia can custom print a CD-R or DVD-R with your artwork or company logo. We professionally print blank CD-R or DVD-R discs that allow you to burn your own data or music. Custom pre-printed blank media is popular for businesses that need a professionally printed company branded CD-R or DVD-R. Printing options include a Full-Color inkjet process or with a more economical 1-Color (black) permanent ink. USB flash drives are becoming the new portable media. With storage, data transfer, portability and promotional capabilities, a USB flash drive has unlimited uses. 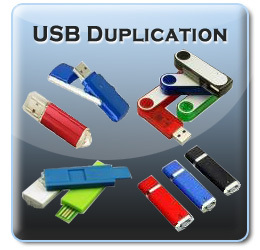 We now offer a variety of USB flash drives with custom printing, data transfer and duplication. USB Flash drives can be branded for any company for the purpose of sharing files, product catalogues, marketing presentations or software distribution. "for jobs less than 1000 pcs." Duplication is more cost effective for jobs below 1000 pcs or jobs that require a short turn-around. We use professional robotic CD/DVD duplication equipment to copy or "burn" your DVD or CD master. The duplication process copies your master bit for bit and creates a mirror image of your master. We can print on the surface of the disc in black or color and custom packaging is available. "cost effective for jobs 1,000 pcs and up"
Replication is more cost effective than duplication for large jobs, 1,000 pcs and up. 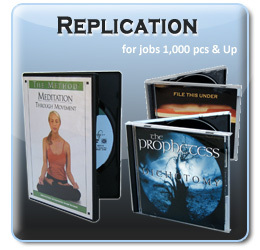 Replication is a process where the CD or DVD is made from raw materials and stamped from a glass master. It is more cost effective in higher quantity. Printing is done with silkscreen or offset printing machinery. Sleeves, inserts, booklets, jewel case, DVD case and shrink-wrapping are common packaging options. What's the difference between Duplication and Replication?